Human Antigen R (HuR) is a RNA binding protein which regulates the decay of thousands of labile AUUUA mRNAs. In response to cell stress, inflammation, human obesity, or within tumor micro-enviorments HuR regulates cellular protein expression patterns to promote cell survival. HuR has been implicated in cancer, viral, cardiovascular, neurological, muscular, and inflammatory diseases such as diabetes. HuR protein expression or localization has also been shown to effect both the clinical-efficacy of cancer drugs and the clinical prognosis of cancer patients. The HPS changes HuR protein expression which effects AMPK in cancer and diabetes. The HuR mRNA Protective Sequence (HPS) targets HuR protein expression by attunuating microRNA regulation at a composite target site for miR-9, miR-125, and miR-133 within HuR mRNAs' 3' untranslated region (3'UTR). The HPS is a cell/water soluable 22 nucleotide ssDNA HuR mRNA mimic which is applied, not transfected, to cells in-vitro or injected in-vivo to partially sponge the above miRs. Changing HuR expression with the HPS may make cancer more responsive to treatment with specific cancer drugs and decrease metastatics when the HPS is combined with calcitriol. In specific Prostate, Breast, and Ovarian in-vitro cancer cell tests the HPS deregulated HuR and inhibited ERK and AKT phosphorylation. HuR regulates metabolism. AMPK mRNA is a HuR binding target, HuR localization is AMPK dependant. Investigating the indirect and direct effects of the HPS on cell metabolism/diabetes and cancer is warrented due to HuRs wide-spread regulation of cell pathways. HuR mRNA targets may be found at AREsite1 & ARESite2. 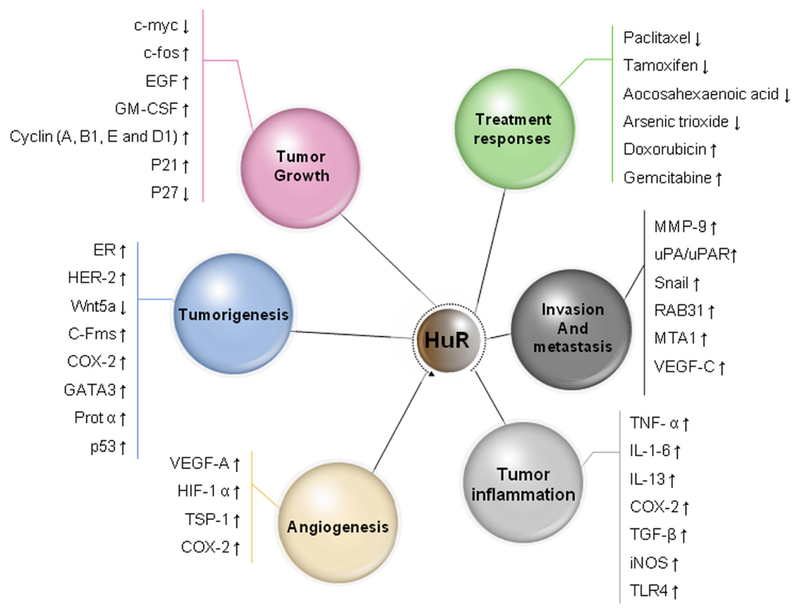 HuR Protein Expression Related Cancer Traits and Signals Sustains Diverse Cancers Types. The goal of this website is to inform people about HuR and to request researchers to use the HPS in their Scientific Tests. The HPS is stable at room-temperature, water soluble, cell-permeable, commercially available from oglionucleotide suppliers. cell-lines and in normal colon cell line CCD-18co. By qPCR the HPS was shown to change HuR stabilized mRNAs SRC and MAP3K in PC3 and DU145 Prostate, HT-29 Colon, SK-OV-3 Ovarian and A549 Lung cancer cell-lines and normal Colon cell line ccd-18co. In the PTEN deficient PC3 prostate cancer in-vitro cell tests the HPS reduced growth rates up to 56%, inhibited Boyden chamber migration and ORISTM wound-healing. HuR has also been reported to effect migration, colony formation, and proliferation in this PCa referance. By next-generation nCounter mRNA analysis the HPS changed the abundance of many cancer related mRNAs in PC3 and DU145 Human prostate cancer cell lines. ELISA assays showed that AkT Serine 473 phosphorylation was inhibited PC3 and DU145 Prostate, MCF-7 Breast, and SK-OV-3 Ovarian Cancer cell-lines but not in CCD-18-co normal Colon cells. Conclusion: By Western-Blot the HPS is a HuR protein expression effector in PC3 and DU145 prostate and in other cancer cells? Evaluating HuR regulatory activities and expression may mitigate clinical trial risks. HuR is up-regulated up to thirty-fold to sustain Human cancers. HuRs' up-regulation and cytoplasmic accumulation has been linked to clinical out-comes. Clinical trial candidates may be screened for HuR cytoplasmic accumulation prior to their enrollment. If a drug has been pre-tested and shown to be more or to be less effective where HuR cytoplasmic accumulation is higher; then, the clinical trial candidate may be directed into a clinical trial which is tuned to their individual HuR cytoplasmic accumulation. By employing personalized pre-screening of HuR expression the benificial effects of your drug candidates may be enhanced. Evaluating HuR regulatory activities and expression may optimize drug development. may overcome HuRs' negative effects on the medicinal actions of Paciltaxel and Tamoxifin. In theory, combining the HPS with new or existing cancer therapeutics may lead to a further understanding of HuRs' positive or negative roll in the medicinal actions of that therapeutics. If HuR expression is controlled or cycled with the HPS; then, it may be possible to optimize the effectiveness of cancer drugs to increase their efficiency and the efficiency of the drug development pipeline. Also, you may use the HPS to adjust HuR levels to optimize the efficacy of your cancer drugs, even cancer drugs which have failed in earlier clinical trials. To understand the value of HuR in your cancer drug development program please read the following patents. 1. Modulating levels of RNA-binding proteins for the treatment of breast cancer, US 20110110896 A1. 2. HuR-Associated Biomarkers, US 20110223616 A1. The biology of Rats is far closer to Human biology than mice are; therefore, HuR mice model results are less certain. The creation of additional HuR animal models is not required to proceed with testing the HPS. The HPS was dosed in a Rat model at one micro-molar, twice a day, for three weeks, and no adverse effects related to the HPS were noted in the pathologist report. Pharmaceutical companies use Rat models to validate and confirm Murine model findings; thus, Rat models are preferred . Is HuR expression behind the Warburg Effect in cancer? AMPK activity has been shown to be behind the Warburg Effect. HuR is known to amplify AkT expression which deactivates AMPK. HuR also regulates numerous other metabolic pathways. Thus far drug companies have targeted the effects of HuR regulated pathways with various drugs and MABs; however, it may be more effective to target HuR expression which is the root cause of under/over-active onco-proteins and kinase. HuR is a multi-pathway drug target, the HPS targets HuR regulation and the regulation of three micro-RNAs on their respective mRNA targets. The HPS target site occures one time in the Human genome within HuR mRNA 3' UTR. Is HuR expression behind AMPK activation in Diabetes? HuR protein expression changes in diabetes may change AkT or LKB1 which effects AMPK, Recently Hooten et al at the NIH established a link between HuR and HUR competator AUF1 and cellular senescence. In that work decreasing AUF1 in the cytoplasm by activating AMPK increased Dicer enzyme levels. After reading the study you may also postulate that a slight changes in HuR expression which deactivate AMPK may be reversed with the HPS to restore normal glucose metabolism in-vitro and in-vivo. It is suggested to test the HPS effects on glucose uptake in diabetic cell-lines and then in one or more Rat models. HuR regulates cell metobolic states and HuR regulates thousands of pathways, some of which are anaerobic non-glucose and some of which are areobic glucose metabolism pathways. Changing HuR expression with the HPS should flip cells back towards normal glucose metabolism and simulate caloric restriction advantages in longivity. Is the HPS better than other HuR inhibitors or HuR knock-out Mice? is designed to not knock-down the microRNA families that it prevents from attacking HuR mRNA. The HPS is not a HuR protein expression knock-down tool. Therefore, the functions of HuR and the micro-RNAs that the HPS attenuates from attacking HuR mRNA remain active so that biological systems may be studied with high-fidelity. HuR regulates a translational network within cells; thus, if a small-molecule is disruptive both cellular and life sustaining processes will be compromised. The HPS has many advantages over small-molecules. Morevoer, the HPS is available to any researcher who choses to order it. Scientists: Please order the HPS, commercially available, and conduct tests on cancer or diabetes cell-lines and models. Non-Scientists: Please tell other Cancer and Diabetes researchers about Human Antigen R (HuR), the HuR Protective Sequence, and this website. Post this website to Social Media and ask others to share it. Drug Development Companies or researchers: Consider adding HuR expression and cytoplasmic localization testing to your pre-clinical trials on cancer drugs. HuR protein expression or HuR cytoplasmic localization may have an impact on your drugs performance. Consider adding HuR protein screening to you clinical trial enrollment process. By accounting for HuR the performance of your drugs may be optimized to overcome the effects that HuR will often have on the action of most drugs. The HPS may be used to change HuR expression. Also, if you test the HPS in diabetes cell-lines and models you will find that HuRs reacts to over-weight stress at the cellular level by a slight decrease of HuR protein concentration in the nucleus, and a slight increase in the cytoplasm. HuR re-localization underlies diabetes along various pathways as HuR acts to mitigate the effects of stress within the whole body enviorment by translocating to the cytoplasm at the cellular level. Natural Products researchers: please read the dissertation and explore the Glyco-Lipid-Peptide biopolymer in Cancer models. This site is about a tool to change HuR protein expression. The ssDNA HPS is not a drug, promoting the HPS is a non-profit activity. The HPS is ahead of its time because it is a multi-siRNA sponge. SiRNA also work to change HuR expression; however, the HPS regulates not only HUR protien expression but also the expression of miR-125, miR-133, and miR-9 targets. In a small animal study the HPS with calcitriol appeard to inhibit MatLyLu migration to a rats lung. At 1uM the HPS did not show adverse effects in the Rats. Competing self-interests for research funding, publications, and exclusive use of the HPS as a tool to change HUR expression have thus far held at bay the validation BY PUBLICATION of the HPS by the ELAVL1/HuR scientific community. The HPS is likely already being used to dynamically increase or decrease HuR expression to advance scientific research. Thus, I am appealing to the larger scientific community to validate and publish your results on the the HPS. DNA and RNA drug companies have just began to explore compounds which modulate the activity of two microRNAs. The HPS exploits a composite target site where the three major miRNA regulators of HUR mRNA attack. If you prefer siRNA aginst HUR mRNA works for the collection of data for publications which fulfill grant requirments. If you wish to study the real-time activity of HUR in a non-disruptive manner, try the HPS. The cost of the HPS in purified form from Oglio suppliers is less than $100 for enough material to conduct a dozen or more cell tests in triplicate. Others have targeted HuR is interesting ways, such as siRNA in 3D nano carriers, disruptors, etc. The question is which targeting method, the HPS or otherwise, may be used in the clinical long-term treatment of diabetes and which substance used to target HUR is tolerable to human beings undergoing cancer treatment ? DNA drugs such as the HPS may be safer than other drugs which have a greater chance of producing off-target side effects within the body. Perhaps a side by side comparison of compounds which target HuR both in-vitro and in-vivo studies would demonstrate which HuR protein expression or nuclear localization compound(s) reduces HuRs negative health effects Also which compound effects changes to HuR expression to fine-tune the effetiveness of cancer drugs. HuR is involved in many human health issues. The HPS may hold the key to safely target HuR in human beings. The HPS will eventualy be published when HuR is seen as an approach to treat both cancer and diabetes.